Device Detox: Which could you do without? These days it’s hard to go anywhere without seeing someone distracted by a smartphone, tablet, MP3 player, or other device. Chances are also high that you, yourself, are addicted to some sort of gadgetry (admittedly I’ve been slightly obsessed with my NookColor lately). But could you live without those devices? 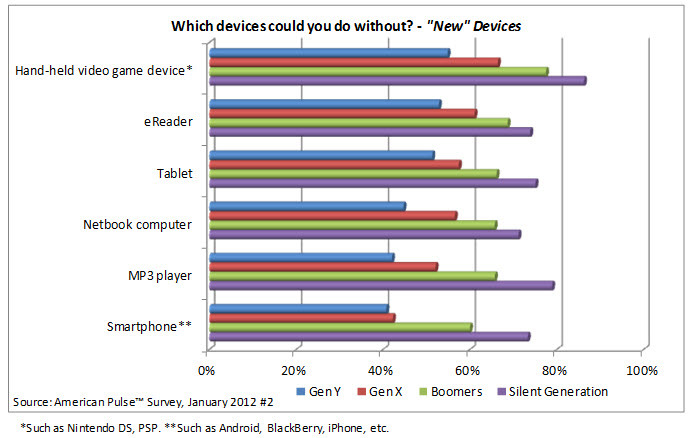 So while the majority of Boomers and the Silent Generation said they could do without a Netbook, an MP3 player, or a smartphone, the majority of Gen Y implied they wouldn’t be able to part with these devices. The majority of Gen Xers wouldn’t be able to part ways with their smartphone either. 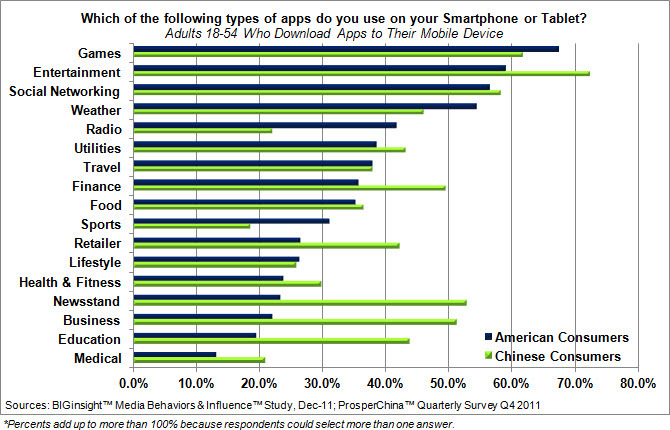 Further, only half of Gen Y said they could do without their hand-held video games, eReaders, and tablets. 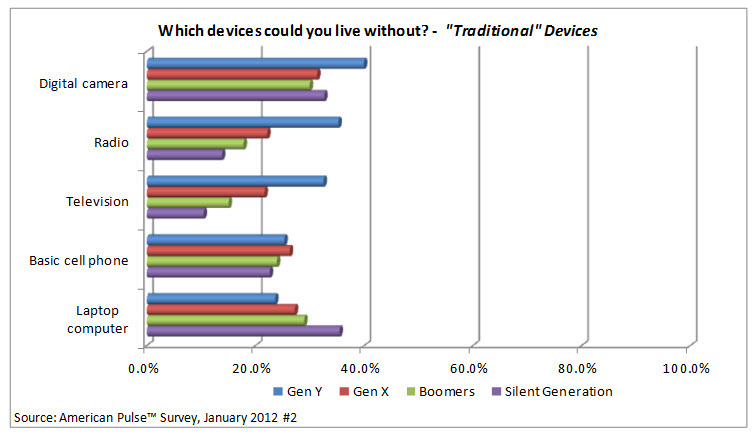 While only a small portion of consumers, regardless of age, could do without these more traditional devices (suggesting all consumers are dependent on some level of technology), Gen X and Gen Y would have less trouble than the Silent Generation giving up these gadgets. But why is this? Well, perhaps because if they were forced to do without these basic devices, Gen X and Gen Y could replace their digital camera and basic cell phone with their smartphone, their radio with their MP3 player, and their television with streaming video on their tablet.